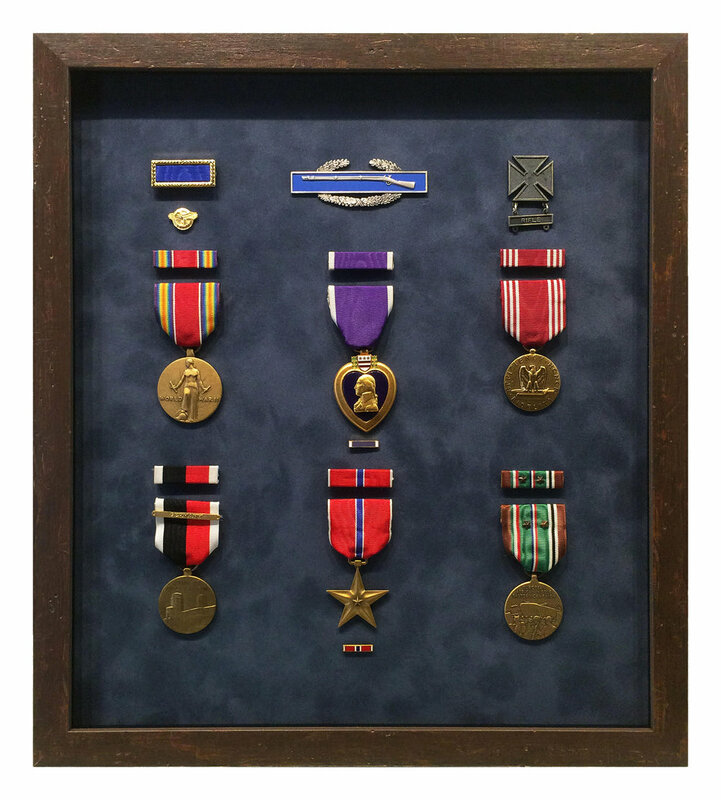 We are constantly amazed and delighted at the diversity of artworks, documents, memorabilia, heirlooms and objects that our customers routinely bring us to frame. Here are some of our favorites. Hopefully these will inspire you to examine your own collection of art treasures. 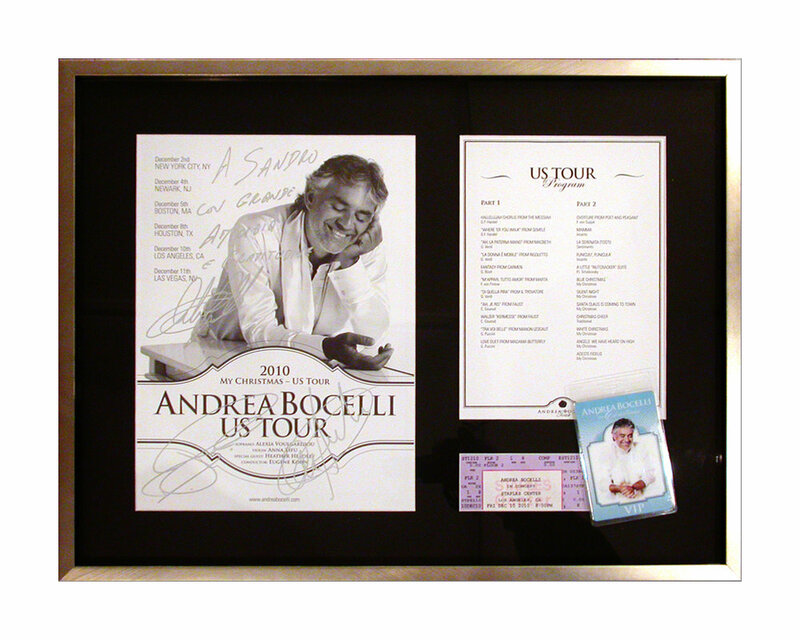 Consider how, with the perfect frame designs, they could look great on your walls and transform your environment. Winter landscape oil painting in artist-made birch twig frame. To highlight and protect this delicate artwork, it was float mounted on a neutral grey mat board and placed in a simple white shadowbox frame. This watercolor of Lincoln Park and the Chicago skyline was commissioned by the customer as a one year anniversary present. Created by Chicago artist Steve Slaske, the painting depicts the customer proposing to his wife on the lagoon bridge in the midst of this spectacular setting. This child's Christening gown was floated on a neutral gray mat and placed into a vintage-looking white barnwood frame, . 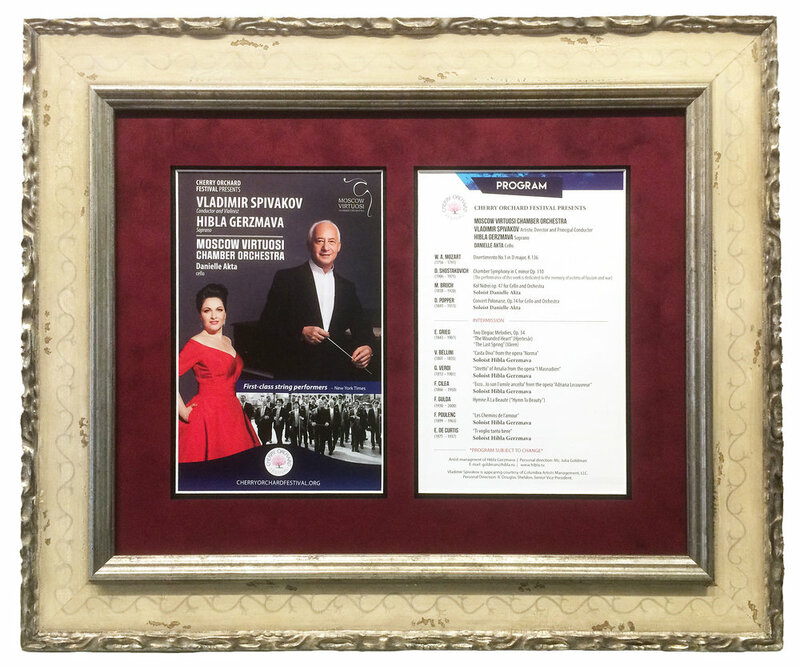 This concert program for the Moscow Virtuosi Chamber Orchestra was framed in a Larson-Juhl "Bolshoi" frame with a burgundy suede mat. Museum glass was utilized to protect the program from UV light and minimize reflections. 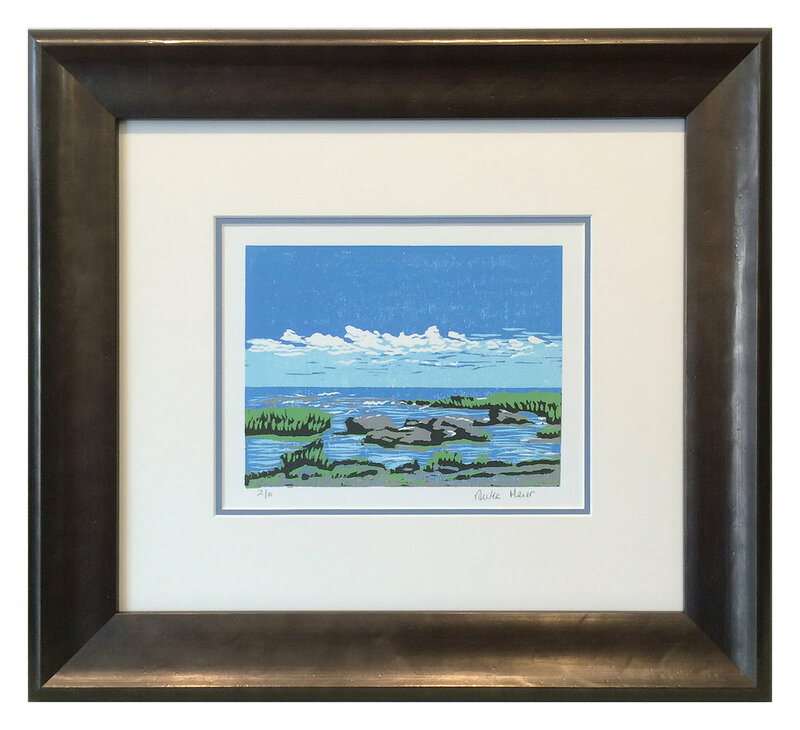 This wood block landscape print was framed in a beautifully detailed silver and black acanthus-leaf moulding. An 1897 vintage map of South America framed in a green distressed frame with gold accents. An illustration of Devi, The Goddess of All Existence, in a brushed gold frame that complements the richness of the artwork. A Southwest-themed print intended to welcome guests into the home. The rustic wood frame and leather-colored mat complete the design. The customer created a series of three Polaroid photographs that document the three places that he and his girlfriend visited on their first date. 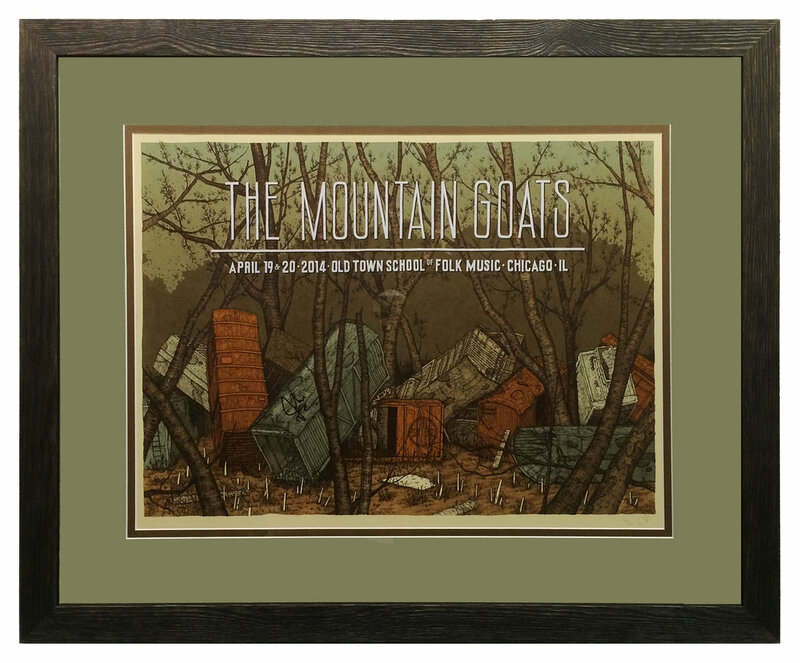 The sepia-toned images have been float mounted and placed within a window in a double mat and surrounded by a metallic-finished wood frame. A collection of traditional Mexican Loteria cards are grouped within a four-layer mat and a wide, ornate gold frame. A selection of photographs from a mother-daughter trip to Mexico are arranged in a multiple-opening mat to document the adventure. The vintage-looking gold frame adds an elegant touch to the design and makes a reference to the old architecture depicted in some of the photos. 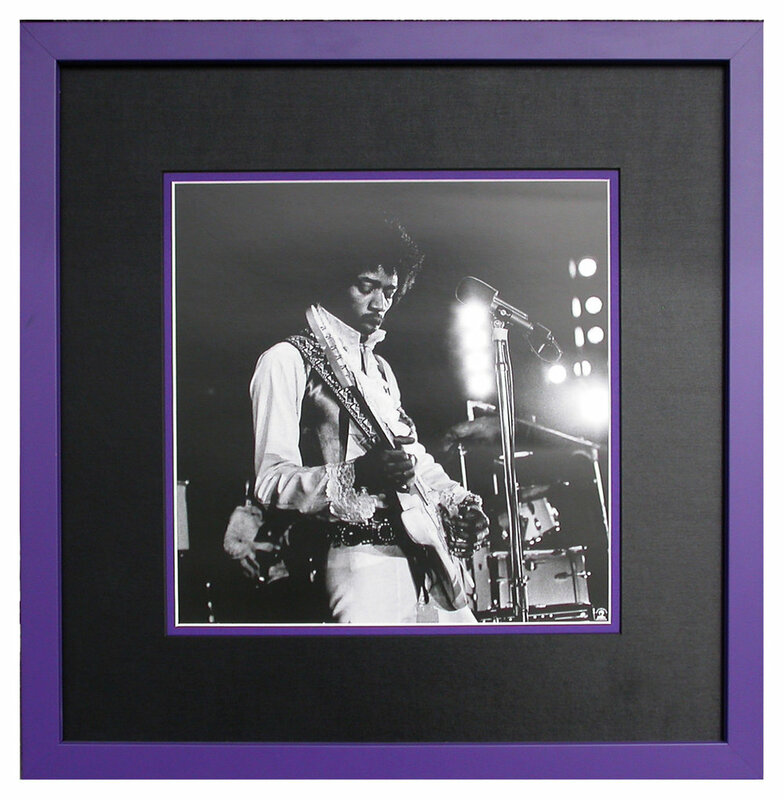 A black and white photograph of Jimi Hendrix in concert features a black top mat with a purple inner mat and purple frame to suggest (what else) "Purple Haze"! One of many possibilities for framing diplomas. 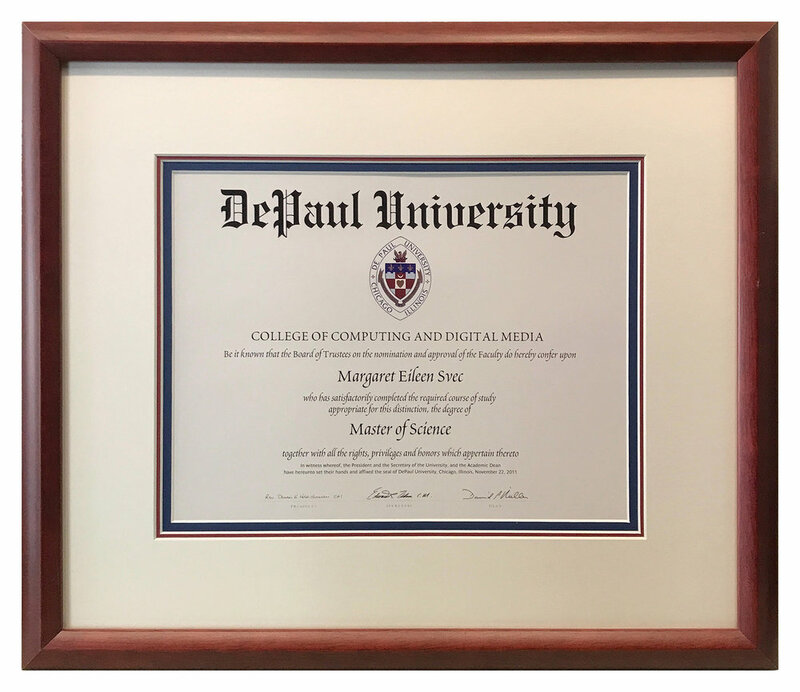 This example employs a triple mat using a creamy white top mat to coordinate with the document's paper and two inner mats in red and blue...DePaul's school colors. A mahogany frame completes the design. A rough-hewn blue-gray moulding is stacked with a cream-colored fabric liner to frame this small oil painting of an Irish farmer surveying his fields. This fanciful interplanetary travel poster was designed by NASA's Jet Propulsion Laboratory. To harmonize with the poster's retro look, triple mats with rounded corners and coordinating colors were paired with a polished metal-veneer frame that suggests the metal skin of a space craft. This highly detailed oil painting of a room scene is tiny...only about 2 inches by 3 inches, but it is given an air of importance by framing it in an ornate gold frame with a black fabric liner. 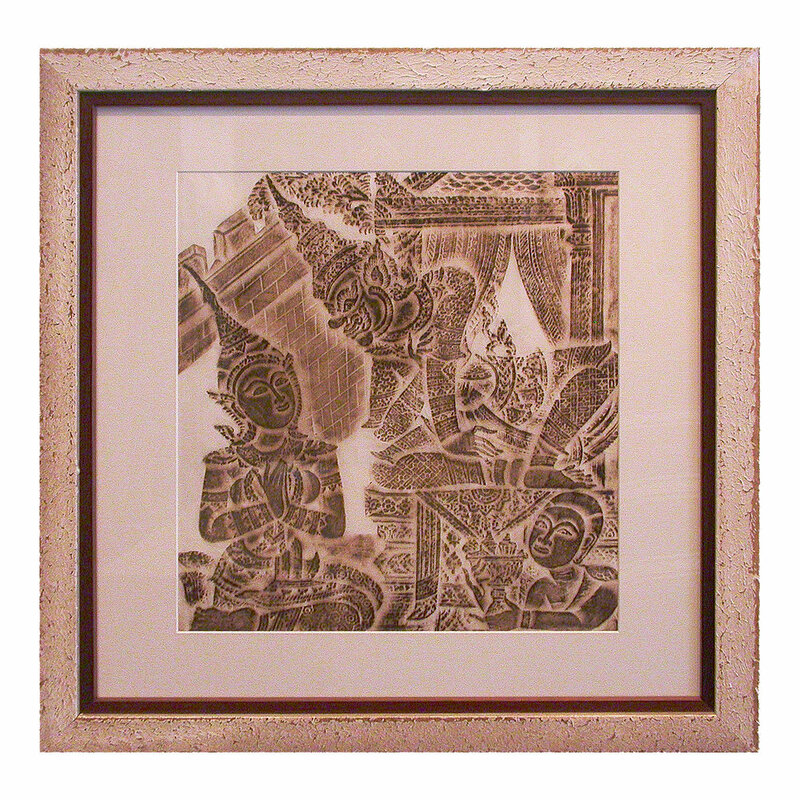 This rubbing depicting three Deities was taken from a Thai temple. The frame is made up of two two stacked mouldings; a white distressed wood outer moulding and a smooth-finished black moulding. A collection of vintage college club and fraternity pins is nestled within a velvet top mat and thin inner mat in the school colors. This collection of circa 1940's Japanese puppet heads seems to emerge from the darkness. 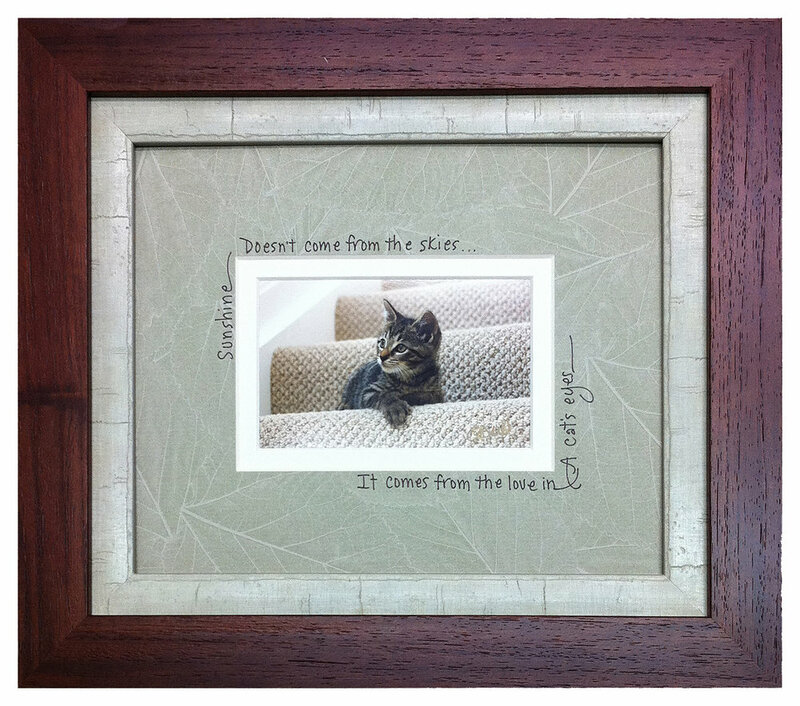 The effect is created by the use of a black velvet lining within a black shadow box frame. 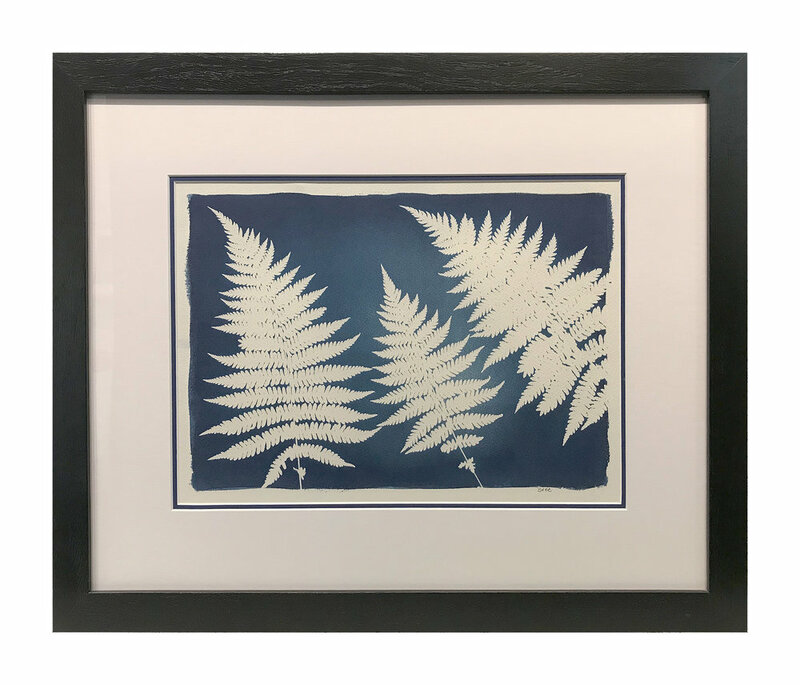 This cyanotype print is framed in a simple black wooden frame with a double mat. The inner blue mat matches the blue of the print. Gyotaku is the traditional Japanese method of printing actual fish, a practice which dates back to the mid-1800's. 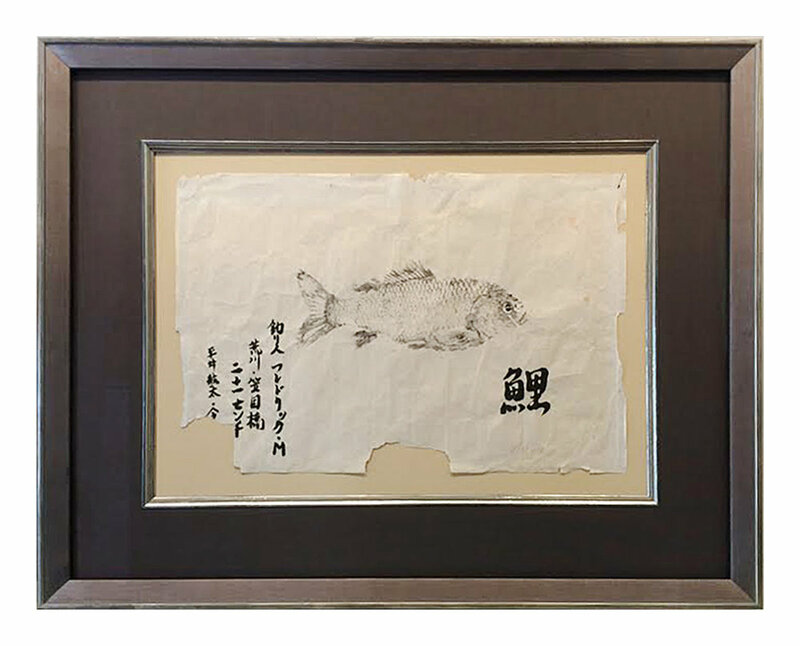 This guyotaku print is float mounted on a cream-colored board and surrounded by a silver fillet that harmonizes with the mottled silver frame. This oil painting of a Cuban jazz musician is framed in a stacked frame (two mouldings put together). The texture of the outer frame mimics the surface textures of the artwork, while the glossy yellow inner frame coordinates with the golds and yellows of the piece. Ancient tools, jewelry and proto-money from the Mediterranean were framed on a green fabric mat within a brown basket-weave wooden frame.